We are very proud of the Con-Tech Systems Ltd. machine shop. CTS hired Brent Smith in the early summer of 2012 as our Machine Shop Manager and also purchased the specialized equipment required to start our own machine shop. 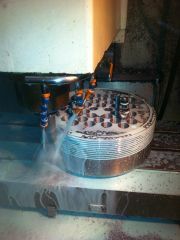 Brent started BDS Machining in 2004 and CTS was one of his first customers. He started out renting only a manual mill and manual lathe, but soon purchased a CNC vertical machining center capable of machining our anchor heads and stressing equipment. Con-Tech Systems Ltd. now has the capabilities to do all of our own metalizing. This automated process was custom designed by Brent to accommodate many of our TITAN products. Brent's years of experience in machining, hydraulics, electronics, PLC's, fabrication, and pneumatics have already proven to be a tremendous contribution to CTS. Brent's long time employee, Will Holder has also made the move to CTS. His skills as fabricator, machinist, and mechanic are a great asset as well. Con-Tech is pleased to welcome both Brent and Will to our staff, as well as their current support team, and are looking forward to the many opportunities which lie ahead.